By now, it is clear that many officials either willfully ignored or missed warning signs that the mass murderer who killed 17 innocent Americans in last month's shooting at Marjory Stoneman Douglas High School in Parkland, Florida needed severe mental help. But, until today, it was never clear that anybody had actually recommended Nikolas Cruz for involuntary institutionalization. The Associated Press now reports that school officials and a sheriff's deputy recommended that Cruz should be "forcibly committed." 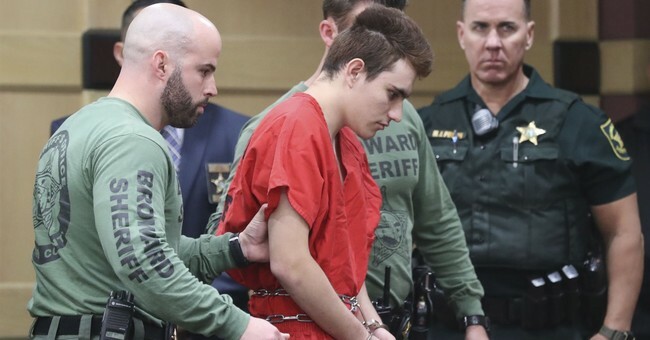 ...documents in the criminal case against Nikolas Cruz and obtained by The Associated Press show school officials and a sheriff's deputy recommended in September 2016 that Cruz be involuntarily committed for a mental evaluation. As the AP notes, the school resource officer who recommended institutionalization was Scot Peterson. Peterson is the man who resigned for failing to enter the building where the shooting was occurring for several minutes after arriving first at the scene. Had Cruz actually been committed, he more likely than not would have been prevented from purchasing the deadly weapons used in the horrific shooting.